On August 29, 1854, Daniel Halladay a machinist, inventor, and businessman patented the first commercially viable windmill—Halladay’s Self-Governing Windmill. Halladay had been approached to work on the design by a local Ellington businessman, John Burnham. Burnham was involved in the pump business and understood that if a reliable source of power could be found to bring ground water to the surface he could significantly increase his customer base. Windmills had been used for centuries to grind grain, draw water, and power machines. So what was revolutionary about Halladay’s design? It allowed the windmill to automatically turn to face changing wind directions, and it regulated and maintained a uniform speed by changing the pitch of the sails—without human oversight. The Tolland County Gazette reprinted an article from the New-York Tribune, in July of 1854, describing Halladay’s invention of a windmill with its self-furling sails: “the wind wheel is ten feet, and it has been in operation for six months without a hand being touched to it to regulate the sails.” The article went on to detail the unique design stating that the windmill would stand still during a storm with high winds, the edge of the sail wings facing into the wind, and as the storm died down the wings would gradually resume their position to catch the breeze. The windmill had also successfully drawn water from a well 28 feet deep, moving it more than 100 feet to a small reservoir in the upper part of a barn. The cost of this new-fangled invention was only $50 with the cost of the pumps and pipes running an additional $25. Halladay quickly formed the Halladay Windmill Company of Ellington, eventually moving the firm to South Coventry and manufacturing there until 1863. Burnham encouraged Halladay to move the business to Batavia, Illinois, to be closer to the expanding Midwestern market and to better capitalize on the growing number of water-thirsty steam engines making their way across the country on an expanding network of railroads. 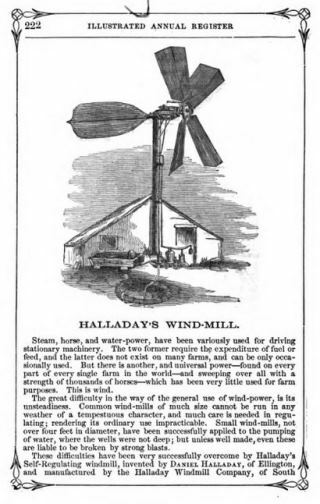 Farmers and ranchers on the Western plains and prairies also looked to Halladay’s US Wind Engine and Pump Company. Its products sold in the thousands to this market, where the ability to harness wind power made it significantly easier to provide much needed water for crop irrigation and maintaining livestock. “Approved June 30, 1854.” Tolland County Gazette. July 27, 1854. Connecticut State Library, Newspapers of Connecticut. Link. Smith, Maryanna S., and Dennis M. Roth. Chronological Landmarks in American Agriculture. Rev. Version, Nov. 1990. Washington, DC: United States Department of Agriculture, 1990. Link. Thomas, J. J. Illustrated Annual Register of Rural Affairs: A Practical and Copiously Illustrated Register of Rural Economy and Rural Taste... Vol. 1. Albany, NY: Luther Tucker & Son ..., 1858. Link.